These named WWII Navy uniforms were passed down to me from my grandfather who served in the South Pacific. Thieves trace their way to your collection in order to steal from you. Claims (false or otherwise) are made that your item does not belong to you. Used for fraudulent militaria sales. Without belaboring every possible scenario, this post will focus on the four most common potentially negative outcomes. Ship’s Cook/Baker, C. A. Erickson is clearly stenciled inside this WWI dress blue uniform jumper. My collection is predominantly made up of uniforms that belonged to one of my relatives and the items were passed down to me due to my obvious interest in preserving family history. However, I have made some purchases of uniforms and other personal (named) items that belonged to veterans with no connection to me or my family. Uniforms are normally named (the service member placed identifying marks on the piece – normally on the manufacturer’s label or stenciled in a prominent location on the inside of the garment) with the troop’s last name, first and an initial and possibly their service number (there are variations and exceptions). When one goes as far as to share the identification details of a specific item online (as I did for articles such as, Militaria Rewards – Researching the Veteran and Academic Baseball Award: Rear Admiral Frank W. Fenno’s Baseball Career), I am risking someone reaching out to me to make a claim that the piece belongs in their family’s possession. Virtually anyone can make a claim to the veteran’s items and state that they are the rightful heir of something that I purchased from a dealer, antiques store or private collector. Within our community there has been lengthy discussion surrounding what one should do if this situation is presented to them by a supposed family member. The stories (of the militaria leaving the family) are varied, ranging from theft to an heir not possessing interest in the military history (who sells the items rather than to pass them to another family member) to an unintended sale. It is easy to be sympathetic but that can be problematic for the collector as it is difficult to determine if the alleged family member is who they say they are (rather than another collector applying guilt and sympathy to get their hands on a desired piece). Here is a fantastic piece that was written regarding what family members should consider prior to contacting a collector in seeking the “return” of a family item. With regards to the Admiral Fenno medal in the article listed above, I was contacted by a family member that was surprised to find that this medal was not in the family’s hands, let alone that it even existed. I was asked how it came to be in my hands (purchased from a picker who bought it at an estate sale) and speculated that the medal was sold along with other household belongings without any family members realizing what it was. The conversation was friendly between us as we exchanged a few emails. However, the person that I was communicating with wanted me to call them to chat about it further (which left me sensing that there was a request forthcoming). What I was thankful for was that the family member did convey additional history associated with the admiral that wasn’t available through research means. As of now, I am still hesitant to make the call as I don’t want to be asked to give it up. I suspect that the conversation could have been far more direct and uncomfortable between us so I am thankful with what I experienced. We have to be careful of who we invited into our homes being careful to limit visual access to these treasures when we answer the door to the furnace repairman, the plumber or the appliance technician. While they may be fantastic at their jobs, they might also be unwitting participants in tipping off burglars to the militaria inside your home. In addition, collectors need to consider how they share their pieces on social media. If they provide their real names and hometown locations in their public profiles, they could be providing a picking list and a treasure map to these seekers. If one shares their collection online, they should lock down their profiles and limit who can see personal details. Also, be cognizant of what is visible in the photos themselves for easily recognizable landmarks that can be used for locating. In light of the previously listed risk, legally purchasing militaria can very well end up being an illegal transaction. In other words, you could be the recipient of stolen property. There are occasions that arise that upon sharing your collection item online, you face a challenge from someone claiming to be the legal and rightful owner. When one recognizes the flow of militaria from seller to buyer and that by the time it ends up in your own collection, it could have changed hands a few times. The piece could very well have been stolen from the veteran or a subsequent collector before the present owner received it. Imagine the thief selling the item to a picker who, in turn sells the piece at a flea market. That buyer then lists the piece on eBay where you, the collector purchases the piece in good faith. You proudly share your “score” with other collectors when you are contacted by the theft victim. What then? As with essentially all collecting, the above scenarios are very real. What do you, the collector do? Imagine you paid thousands of dollars for the item? Do you simply surrender it to the victim? How do you know that this person is being honest? How can the claims being made be verified? When a claim is made against your collection (be it the family, the veteran, a collector, etc. ), the best action you can take is to be patient and consider the facts. Does the claimant possess photos of the item? Has a police report been filed (with a genuine case number) that matches the story? Did you record the details (dates, seller, price paid, etc.) of your transactions when you purchased the item? False claims are a part of this hobby and the unscrupulous folks thrive by preying upon good-natured, honest people (consider what happened to Phil Collins, the musician from the rock band, Genesis: Showing Off Your Collection is Not Without Risk). Collectors need to employ the same due diligence used to make sound purchases when these situations arise. I don’t profess to have the answers for every possible scenario but I am prepared as much as I can be to protect my investments. One of the risks that I want to focus my attention on surrounds the photography that we share of the items in our collections. I imagine that most people don’t consider the copyright protection that exist upon the creation of a photograph. Your photographs that you compose and capture belong to you whether you share them online or publish them in print. No one can reproduce (copy with their camera, grab a screenshot, etc.) without your permission (there are caveats to this and it can be a rather lengthy exploration of the laws and case law). One of the common actions that take place online, on eBay in particular, are the unscrupulous sellers who use other people’s photographs to defraud potential buyers by misrepresenting a similar item or selling taking money for an item that they do not possess and have no intention of delivering. Another aspect of photo theft is that other collectors or hobbyists take your photos without asking or providing attribution. I have discovered use of my images in a few different manners ranging from a news outlet to sports bloggers (a few of my on-field sports photos were used for both without permission nor attribution). Fellow enthusiasts can also engage in these practices. In the recent months, I have discovered that one of my images of a Third Reich piece in my collection (I inherited it from a family member who served in the European Theater during WWII) has been used throughout the internet without my consent. The image was lifted from one of my Veterans’ Collection posts and has been used to illustrate this particular piece as it pertains to WWII German militaria. Understanding that it is quite a rare item, it doesn’t bother me (as much) when used in this capacity. When I found it being shared on an image-sharing site and being passed off as that person’s own work, it ruffled my feathers a bit. 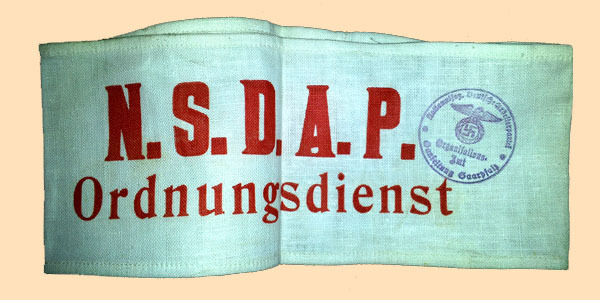 National Socialist Party Security Personnel armband. 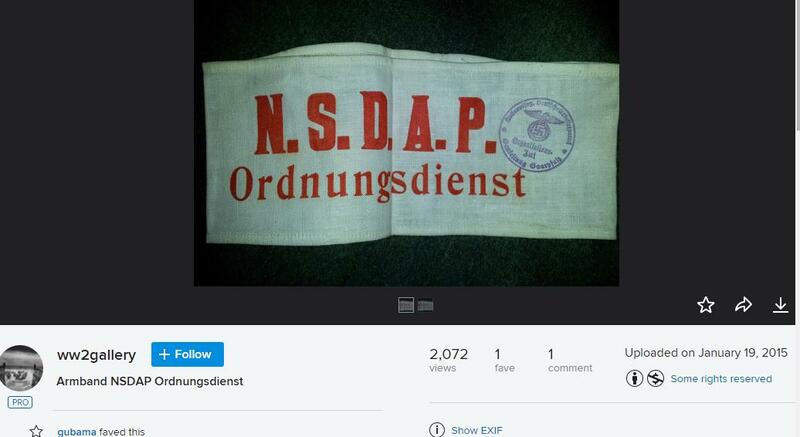 My armband photo has been altered and is listed as “NSDAP Ordnungsdienst Security” on the reference page without my permission. My stolen image of my armband as it sits on someone else’s Flickr account. Collectors must always be vigilant and cautious about how they share their passion with others. Using the internet as the vehicle for exposing your pieces and discoveries is very easy and may seem to be the safe pursuit, but there is no real insulation from those who would seek to do you or your collection harm. Blue Seas, Red Stars: Soviet Military Medals to U.S. Sea Service Recipients in World War II by David A. Schwind (image source: Schiffer Publishing). Many of the stories found within the pages of this site, while centered upon artifacts and items that once belonged to veterans – some those pieces possess researchable history that is traceable to the individual. If you’ve read any of these articles, you know that as much as is possible, I try to provide a snapshot of the military careers of the service members, inclusive of their decorations and awards they received. Acknowledging the achievements of the military member or those of the units for which they were assigned, or the campaigns these men and women participated in, while a common practice within this realm of military service, it is somewhat foreign in the civilian sector. Medals and decorations are a common focus of militaria collectors – especially medals that are engraved (i.e. named) as valor medals typically are at the time of presentation to the service member – due to their unique and very specific historical nature. A group of medals and ribbons that were worn by a veteran provide a visual narrative – a tangible representation of the career of a service member showing, at the very least, when and perhaps where the individual served, if he or she served in combat or was decorated for service above and beyond the norms of duty. There are many areas of focus within the sphere of collecting decorations. Some may zero in on a specific era, military branch, discipline or specialty (aviators, armor, etc.) or specific medal awardees (Navy Cross, Distinguished Service Cross or other valor medals) or those who were killed in action (Purple Heart medals awarded to those who were killed or listed as missing in action). Though I am in possession of several decorations, I am not a collector of medals and ribbons. All that I have were either inherited (I am the steward/archivist for family history) as part of a relative’s group or were acquired as part of my restoration efforts to preserve the full story of a family member’s service. A veteran myself, I recognize that the preservation of my own decorations is part of my responsibility to maintain the family legacy and history of service. With the exception of the decorations awarded to my father (a Vietnam combat veteran who is very much alive and well), I have been given the task of maintaining these priceless family artifacts which are inclusive of the medals and ribbons that I earned and received during my service. I couldn’t imagine seeing family history such as this falling into the hands of collectors rather than being preserved by our following generations. It may be just my perception but it seems as though there is a steady stream of military-history books being released throughout each year with increasing frequency. With the passing of the World War II generation and their stories fading away, our nation’s interest in them, fueled by stories and films that dominated the national conscience from the mid 1990s through the middle of this decade, too has waned. The stories of the common soldiers, marines, sailors and airmen have all but been forgotten. The attention in military stories has turned toward the more recent conflicts in the Middle East is more prevalent as the generation who fought and served in these conflicts is reaching (military) retirement age. However, there are still good stories from WWII that remaining to be told and a recent publication, though now a few years old, deserves my readers’ attention. Prior to the December 7, 1941 attack on Pearl Harbor, the United States’ participation in WWII was in support of our European allies – predominantly Great Britain – by way of supplying materials to sustain their fight against the wave of the Third Reich that was washing over Western Europe. When Americans think about the Battle of the Atlantic, it isn’t uncommon for visions of the Allied convoys and the German U-boats operating in “wolfpacks” hunting the defenseless merchant ships come to mind. However, the overall campaign in the Atlantic Ocean was far more involved and following the United States’ declaration of war on the Axis powers, was truly a multinational alliance effort that led to the defeat of Germany. Many Americans participated in the harrowing and dangerous duties in the Atlantic in striving to support the fight in Europe. Convoy after convoy of materials, food and troops departed ports in the United States heading to destinations in Europe (England, Ireland, Russia) and in the Mediterranean faced the threat of being torpedoed by German U-boats who waited for the vulnerable ships to pass by. Shore-based anti-submarine patrols flew supporting missions from each side of the Atlantic providing air cover as far out to see as could be reached but there were still gaps of open seas that were ideal hunting grounds for the wolfpacks. Convoy WS-12: A Vought SB2U Vindicator scout bomber from USS Ranger (CV-4) flies anti-submarine patrol over the convoy, while it was en route to Cape Town, South Africa, 27 November 1941. The convoy appears to be making a formation turn from column to line abreast. Two-stack transports in the first row are USS West Point (AP-23) — left –; USS Mount Vernon (AP-22) and USS Wakefield (AP-21). Heavy cruisers, on the right side of the first row and middle of the second, are USS Vincennes (CA-44) and USS Quincy (CA-39). Single-stack transports in the second row are USS Leonard Wood (AP-25) and USS Joseph T. Dickman (AP-26). US Navy Photo. Convoys consisted of merchant ships, crewed by a mixture of merchant seaman, active-duty naval personnel and the US Navy Armed Guard (serving primarily as gunners, signal men and radio operators), destroyer-escorts, destroyers and, by 1943, small aircraft carriers that possessed the armament and tactics necessary to conduct anti-submarine offensive measures along with their role in providing protection for the convoys. With the rise of Communism in conjunction with the West’s fight to stem the expansion of the Iron Curtain following WWII, many of these veterans tucked the medals away, opting not to wear them on their uniforms. In his December 2015 work, Blue Seas, Red Stars: Soviet Military Medals to U.S. Sea Service Recipients in World War II, Schwind provides individual narratives of each recipient, inclusive of their military careers and post-service lives. Along with the detailed information, he includes extensive photographs of each recipient’s Soviet medals, their presentation boxes, documentation, vintage photographs and images of the medals themselves. David Schwind’s photographic efforts in capturing the details of these incredible medals is nothing short of fantastic and perfectly compliments his extensive research. This book is not merely a compilation of veterans and their medals but rather a very personal presentation of vignettes, photographs and an extensive amount of supporting references. The book production (by Schiffer Publishing) is first-rate with pages that are substantial and glossy, and printed in full color. The binding is stable and sturdy. Even the endpapers and are impressive with photographs of the veterans’ award cards. After nearly two years of use, my copy of Blue Seas, Red Stars looks like new though I have been through it, cover to cover multiple times and it shows none of the typical signs of use in many books of this size. Speaking of size, Blue Seas’ dimensions are consistent with those of many coffee-table books (9″ x 12″ x 1″) but is far from just a collection of nice pictures. The men who received these Soviet awards were truly heroes and they were so recognized by our WWII ally for their deeds and service above and beyond the call of duty. Many of the heroes in this book will be recognizable to many contemporary navy veterans and history buffs as their names have been affixed to transoms of a few notable combatant naval vessels. Blue Seas, Red Stars: Soviet Military Medals to U.S. Sea Service Recipients in World War II (image source: Schiffer Publishing). A sample page from Schwind’s work, Blue Seas, Red Stars: Soviet Military Medals to U.S. Sea Service Recipients in World War II (image source: Schiffer Publishing). Perhaps the most noteworthy fact of Schwind’s brilliant production is that the of the 217 Soviet medals that were awarded to American sea-service personnel, a significant number of these decorations remain with the veterans’ families and are treasured for their future generations and that more than 100 of the families participated in this project, partnering with the author and granting him access to handle and photo-document these treasures for his book. The photography reveals the details of the individuals’ awards and decorations along with other service-related pieces that breathe life into the narratives of each veteran. The book is printed on beautiful heavy-stock coated paper which provides a wonderful measure of clarity to the text and helps the colors of the awards to leap from the pages. It is my hope (especially within the capacity of my responsibility) that other families make the decision to preserve and maintain their family’s legacy and keep these precious awards to be handed down throughout their generations. However, if these pieces are divested, I hope that collectors will make every effort to assume the mantle of historian and continue the legacy where the family left off. Blue Seas, Red Stars is a great addition to anyone’s library, whether they are a military or naval historian, militaria collector or simply interested in in the little-known relationship between WWII veterans and the Soviet Union’s gratitude bestowed upon them for their service during the war. In the sub-freezing temperatures, you find yourself watching for them. Anxiety has long-since set in and your heart-rate is rapid causing you to draw quick, short breaths from the cold oxygen flowing into your mask. You’re thinking back to the darkness of the early-morning hours, reviewing all of the landmarks as you check the heading. At 35,000 feet, your aluminum tube is barreling ahead, amidst a cloud of familiar shapes, at nearly 200 miles per hour. Your body is no longer aware of the vibrations and deafening roar of the four Wright Cyclone radial engines and their steady drone. You’ve been through this same routine (as if any of this can be considered “routine”) two dozen times before. Sighting numerous Focke Wolfe 190 fighters was sadly a common occurrence for B-17 crews. Suddenly, excited chatter is piped directly to your ears via the cold headset. Your fellow crew-members have sprung to life as they call them out – the dreaded camouflage-painted Focke-Wulf Fw 190 bearing the black cross of Germany. The flight of attackers begins to assail the surrounding B-17F aircraft in your group. You reach for the trusty Browning M2 .50 caliber machine gun as you scan the skies for the attackers. The crew of the Memphis Belle pose in front of the aircraft that returned from 25 deadly missions over German-held positions. Captain Evans is pictured, second from the right in the back row. 52,000 Americans perished in the air over Europe during World War II over the span of three and a half years. Contrast that to 58,000 Americans who lost their lives during the entire Vietnam War. It is difficult to imagine that bomber crews had to complete 25 bombing missions before they could be sent home. More than 750,000 bombing sorties were flown by U.S Army Air Force aircraft over Europe and just under 10,000 bombers were lost. The odds were infinitesimal that one aircraft could survive all of those missions and return home during the war. One of those B-17s that achieved that mark was the famed Memphis Belle (Boeing B-17F-10-BO Flying Fortress Serial 41-24485) – the first heavy bomber to do so. The monumental feat was the subject of a William Wyler documentary, Memphis Belle: A Story of a Flying Fortress, released in 1944 to American audiences by Paramount Pictures. Though I attempted to paint a picture of what it was like for these men, words could never come close to describing that experience. A single mission was harrowing for these amazing men. I often wonder which was more unnerving – the first mission or the twenty-fifth and final one. For Captain Vince Evans, sitting in the bombardier chair for those several harrowing hours on May 19, 1943 on a raid over German port-city of Kiel on the Jutland peninsula. Many questions surrounded this jacket as to its authenticity. Some collectors were quite doubtful while still others suggested that it was genuine (source: eBay image). When an item from one the 10-member crew of the Memphis Belle, it certainly doesn’t go unnoticed. A few years ago, what appeared to be a cut-down, tailor-made officers jacket complete with period correct insignia and devices was listed at auction. Inside the jacket was a label with Captain Evan’s personal information, including his Army serial number (ASN). One issue some collectors raised with this listing was the seemingly incorrect ribbon bar. One important piece absent from the bar was Captain Evan’s Distinguished Flying Cross (DFC) ribbon which was awarded to all ten crewmen. Vince would subsequently receive an additional DFC. The ribbon for the Air Medal is also absent devices which Evans would have had to indicate multiple awards. The Captain Evans jacket label shows his name and service number (source: eBay image). Regardless of the minor shortcomings, the jacket is believed (by several collectors) to be genuine and was more than likely set aside by Evans after the war in favor of a newer uniform. The correct (or better yet, original) ribbon bar was probably removed (by Evans) for wear on the new uniform. The period-correct collar devices are beautifully displayed on the Evans jacket (source: eBay image). The Evans jacket has the SSI of the 8th Air Force on the left shoulder (source: eBay image). Captain Evans’ bombardier wings and ribbon bar, complete with a ribbon from his Air Medal, American Campaign Medal and his European–African–Middle Eastern Campaign Medal (source: eBay image). Following his WWII service, Evans began working with Wyler in his new profession as a writer in Hollywood with two films to his credit: Chain Lightning (starring Humphrey Bogart) and Battle Hymn (starring Rock Hudson). Evans served in the USAF Reserve until his discharge (at the rank of major) in 1953. Sadly, Major Evans would perish (along with his wife, Margery and their 21 year-old daughter, Venetia) in a small airplane when it crashed a few miles short of the Santa Ynez Valley airport in 1980. What the Luftwaffe and Nazi anti-aircraft gunnery could not do, a series of atmospheric conditions did. It was never determined who was in control of the aircraft (Evans or the flight instructor) at the time of the crash. The Memphis “Belle lost one of her sweetest members” wrote Colonel Robert Morgan (in his book, The Man Who Flew the Memphis Belle: Memoir of a WWII Bomber Pilot), “a large piece” of her heart went down that day. More than 40 bids from buyers eager to land a piece of history so closely-tied to the famed aircraft drove the final sale price to $1,026.97 which for many militaria collectors is a bargain considering the notoriety of the Memphis Belle and her crew.